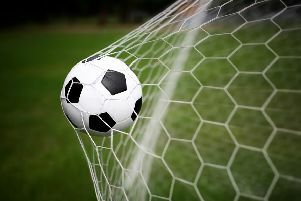 Two goals in the final five minutes earned Chichester City Ladies a 2-0 win over Luton Ladies and a place in the fourth round of the Women’s FA Cup. It was a hard graft for the home side on a difficult weather-worn surface but the Green Army had plenty of chances to seal the victory. The goals came late, Alex Collighan scoring in the 86th minute tapping home past the keeper and a chipped effort from Cherelle Khassal seeing Chichester into the draw. Plenty of hard work was put in to enable the match to pass an early pitch inspection but the teams had to endure a very cold afternoon accompanied by a strong winter wind. Chichester started brightly with the strike duo of Khassal and Jade Widdows showing pace to threaten the Hatters’ back-line. The visitors stood their ground and Chichester would have conceded early had it not been for an alert Emma Alexandre, who was in the right place to clear. Luton had a good period of play with numerous forays into the Chichester half but the hosts’ backline handled the onslaught well with Tiffany Taylor particularly strong in the tackle. Widdows went close with keeper Kezia Hassall doing brilliantly to deny her and then block Jenna Fowlie on the follow-up. Rebecca Barron had a pop from long distance with a looping effort but it lacked the power to trouble Hassall. Alexandre’s headed effort was well blocked from a corner and Chloe Tucker’s strike was just wide. The chances kept on coming – Widdows missed the best of the first-half in a one-on-one situation that saw Hassall make a great save. Early in the second period Chichester were almost the beneficiaries of a goalkeeping howler. Khassal was set up on the edge of the area and let fly with a stinger that was spilled by the Hatters keeper but she did enough to keep it clear of the goal. Luton almost snatching the lead against the run of play. Stephanie Gale found space in the area and her shot hit thepost and somehow rolled along the goal-line, hit the left post and stayed out to the relief of the home bench. That was the closest that the Hatters would come to causing a shock and in the last four minutes, Chichester got the job done. Tucker fed the ball into space for Collingham to race on to. The young striker won the race against Hassall to get enough on the ball from a tight angle and the ball looped sweetly into the back of the net. Two minutes later, Khassal pounced on a ball over the top to produce a sublime chip over Hassall to settle the tie. CCLFC: S Wilson-Blakely, Alexandre, Cheshire, Widdows, Barron, Khassal, Fowlie, Collighan, Tucker, Ingram,Taylor. Subs: Dowdell, Walford, Phelps, Bloomfield, Shine. Chichester City Ladies have appointed Alan Crozier as their new business manager. Crozier joins the club amid changes in the women’s game following the FA’s announcement of the restructured pyramid. The former Pompey Ladies medical lead brings a plethora of experience including many years’ service in the British Armed Forces and working within football and motorsport with roles that include logistics co-ordinator, events manager and PR manager. Crozier has plans to build on the stable foundations already at the club and create a clear development strategy that aligns with the ambitions and visions of Chichester City to reach the top levels of women’s football. Work has already begun to implement the ideas Crozier has put forward. Club chairwoman Caroline Henry-Evans said: “We are very pleased that Alan has decided to join our club. He has a wealth of experience and knowledge that will only help drive us forward from behind the scenes. “We felt we needed to appoint a business manager as our club is growing so fast that we need to be ready for the next level. After meeting with Alan and hearing his proposals for moving us forward, it was an easy decision to bring him on board and welcome him to the green army family.